Enjoy a delightful afternoon of music with your elementary and/or pre-school age children at the Newtown Chamber Orchestra’s annual live performance, “Kids Connect to the Classics Concert.” Help your children discover the beauty and enjoyment of classical music through a fun and nurturing educational experience. The length and content is sensitive to the attention span of the targeted age group. The performance of the musical tale of Peter and the Wolf will be the focus of this year’s Kids Connect to the Classics concert, a family concert. 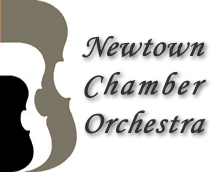 The concert is presented by Newtown Chamber Orchestra now in its 29th season. The story of Peter and the Wolf is adapted by Ogden Nash, the music composed by Sergei Prokofiev. The narrator is storyteller Ms. Jennifer Nejman. The concert will begin with a short overture performed by the Orchestra. An exciting addition to this performance will be a display of artworks from the Concert Cover Contest for elementary school students. There will also an instrumental petting zoo of various instruments for child viewing as well as to carefully touch. Jennifer Nejman​, ​is thrilled to be a part of this wonderful performance with Newtown Chamber Orchestra! Jennifer’s acting credits include numerous community theater performances and events in Pennsylvania and New Jersey. Her favorite roles have included Luisa in “The Fantasticks,” Rapunzel in “Into the Woods,” and Lady Larkin in “Once Upon a Mattress.” Jennifer earned her Bachelor’s degree in Communications and Theater from Temple University and her Master’s degree in Education from Arcadia University. Currently, she is blessed to be able to blend her two great passions for theater and education as a teacher and program director for the Theater program at Hunterdon Academy of the Arts in Flemington, NJ. Also at Hunterdon Academy of the Arts, she serves as the theatrical director for the Show Kids Choir. As a teacher, she strives to introduce children to a lifelong love for theater and music, as she believes strongly in their enduring benefits for body, mind and soul. Jennifer would like to thank Newtown Chamber Orchestra and the audience for granting her the opportunity to share that love for theater and music today. Please join us for this exciting entertaining and cultural event on Sunday, April 28, 2019 at 3 pm in a new location, Newtown Theater, located at 120 North State Street Newtown, PA, 18940.